Don't let another Holiday Season pass without having the Dessert Decorating tools you need! Snap up this 5.1oz Jar of Reindeer Games Holiday Nonpareils. A dazzling combination of Red, Green and White Nonpareils is exactly what you need to compliment your Cakes, Cupcakes, Cookies, Candies, Brownies, Ice Cream & MORE! 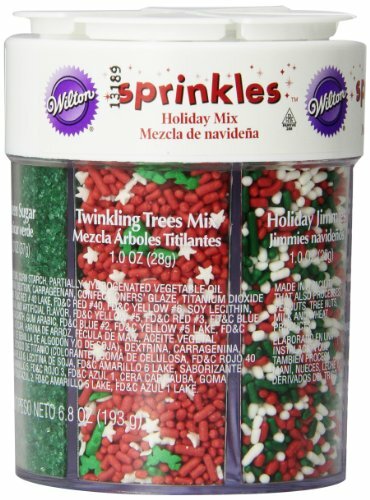 Holiday Sprinkles 4-Pack by Wilton.Complete your Christmas treats with matching sprinkles. Choose from 4 different types of Christmas candy sprinkles including: green sugar (4.2 ounces), Christmas color mix of nonpareils ( 5 ounces), red sugar (4.2 ounces) and green Christmas tree and Yellow star sprinkles with red and green jimmies (3.9 ounces).Certified Kosher Pareve by the Orthodox Union.Net weight: 19.3 ounces (1.2 pounds/ 546 g). 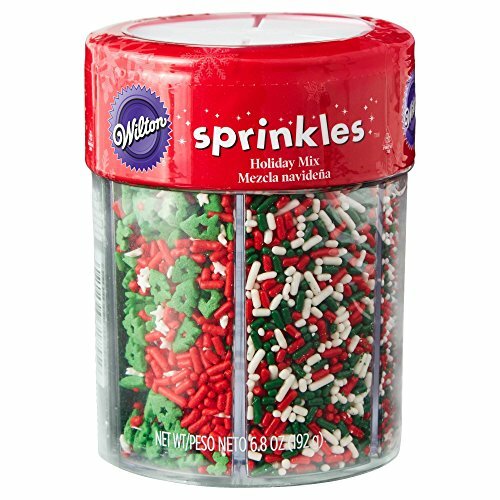 Wilton Holiday Sprinkles Assortment, 6.8 oz. 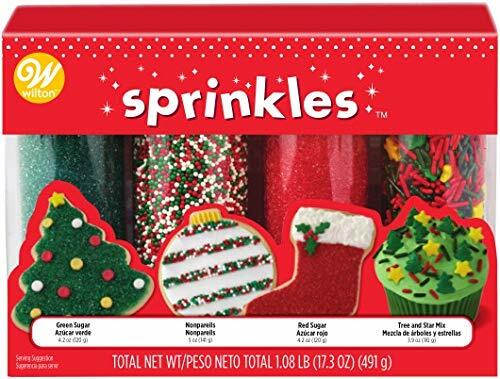 Kids will love decorating all kinds of holiday treats with this fun assortment of sprinkles. Adds a festive touch to cupcakes, sugar and spritz cookies, cakes, brownies and more. 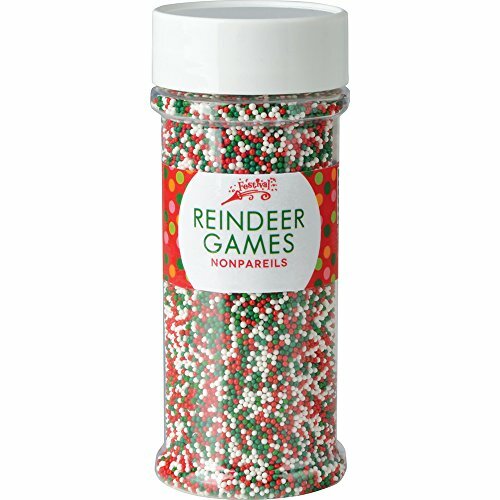 Includes red and green sanding sugars, red, green and white nonpareils, red, green and white jimmies, red, green and white confetti sprinkles plus a medley of green trees, white stars and red jimmies. 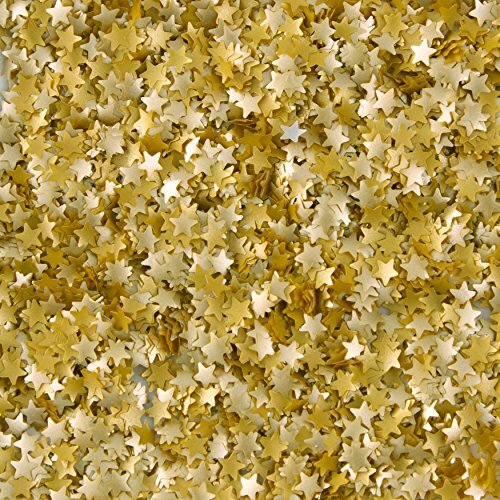 Give your favorite treats a twinkle with glittering gold star sugar sparkles. 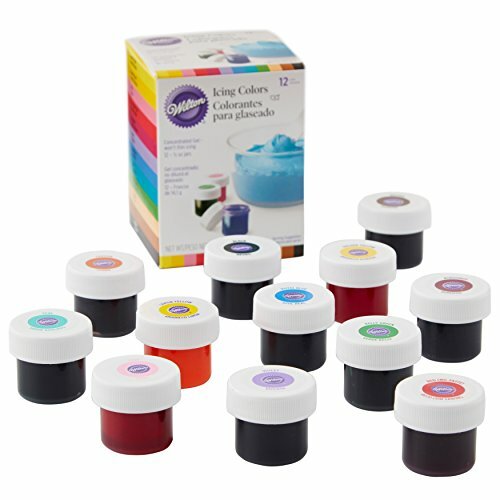 Wilton offers a variety of edible glittered items in a range of colors. 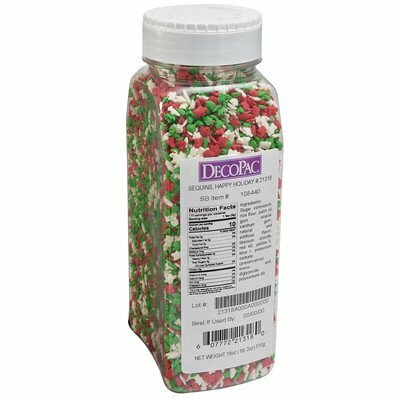 Dress up your culinary creations for the holidays with this Christmas six-cell sprinkle mix from Wilton. With six topping options in one convenient package, you're ready to start decorating cakes and cupcakes. Let your creativity run wild with the red and green sugar or holiday-inspired confetti. 18 ounce hand held container. Mix includes trees, poinsettias and bears.
? Use confetti to decorate your cookies, cake pops, cakes, cupcakes and other baked goods.? Note: This product is prepared and packaged using machines that may come in contact with Wheat/Gluten, Eggs,Dairy Products, Peanuts, Soy, and Tree Nuts. 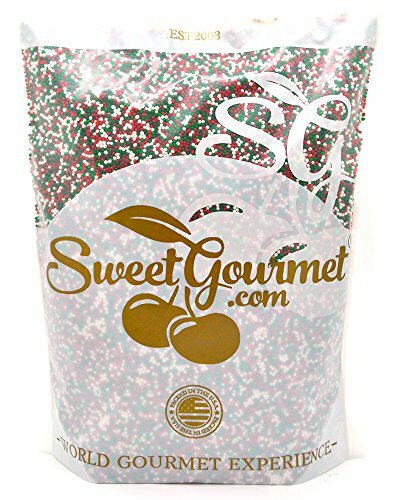 Use confetti to decorate your cookies, cake pops, cakes, cupcakes and other baked goods.Note: This product is prepared and packaged using machines that may come in contact with Wheat/Gluten, Eggs, Dairy Products, Peanuts, Soy, and Tree Nuts.Mixture of white snowflake confetti, red and green jimmies.Store in a cool, dry area.Certified Kosher. Christmas Festive Flurry Mix Tree Wreath Shapes Sprinkles Bakery Topping 8 oz. Edible Confetti Sprinkles Cookie Cake Cupcake Christmas RED CANDY CANE 8 oz. Don’t Choose the Wrong Box Christmas Present Challenge! REAL PRESENTS! !